ALL GOOD THINGS COME to an end. If you hold on to them long enough. 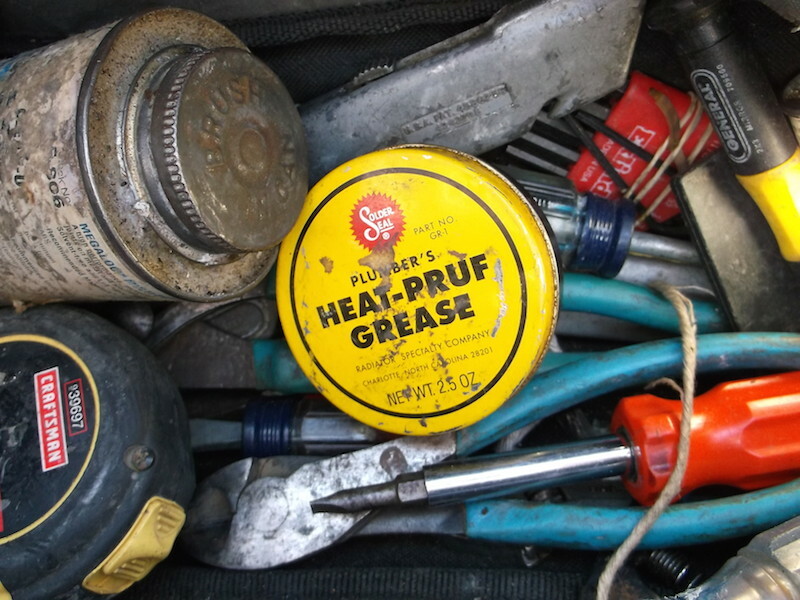 My tin of Plumber’s Heat Pruf Grease was a decade old. She had traveled this country through relocation, out-of-state employment, and back again to home base. And now, empty. A good tradesman plans ahead. A year ago, I tracked down the identical product and purchased three tins. One for Pat Graham, and two for me. Finally, the day came. My tin of grease was truly empty. Good to its last dab. But empty. A shiny new tin was tossed into my tool bag. Our patient? A steam table faucet. Someone had gone to a lot of trouble installing wrong parts. The least I could do is help return function as best I can. A little grease on the spindle. Screw it back in. Replace packing. Grease a pair of new O-rings for its faucet body. Bonnet tightened. Done. Supply valve engaged. Perfect refurbishment. Ready for another two decades of service! This entry was posted in Product Review and tagged jim sergovic plumber, pat graham, Plumber's Heat-Pruf Grease, Solder Seal GR-1. Peanut Butter ◊ Skippy or Jif ?